Competitive Fencers are experienced fencers who regularly participate in local, regional, and national tournaments. As such, their approach to training, fencing lessons, and practice require a strong, determined spirit month to month to accomplish good results. The Competitive program has a basic schedule of two one and a half to two hour sessions per week, and are encouraged to attend Open Bouting on Friday evenings. This schedule might increase in the weeks prior to a major tournament, including weekend camps or extra instruction during the week. These often happen spontaneously according to the needs of the fencers at the club. The Competitive Fencer receives closer attention to technique and instruction of strategy than either Intermediate or Beginners by our Coach. Competitive Fencers have access to the club facilities whenever the club is open. If you want to come in and work out with a different class or practice on the board or Mr Abs (our fencing dummy), or take an additional private lesson with Vladimir, you are more than welcome. Regional and National competitions will require an additional expense on the part of the Member fencers in this program. The Coaching Assessment pays for travel and housing for the Coach when traveling to tournaments requiring one or more overnight stays. 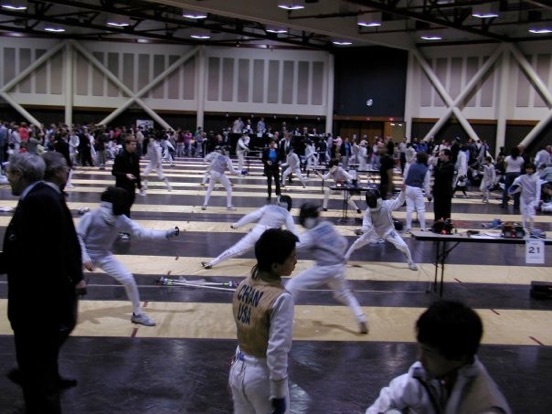 Only those fencers attending a particular tournament are required to pay this assessment, which is not a set fee but depends on the Coach's traveling expenses for the tournament in question. Contact Vladimir for more details. Please note that we have special relationships with a number of equipment vendors and will be more than willing to help you purchase the right equipment at a reasonable price.